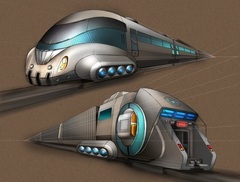 Maglev transportation is an extremely common mode of transportation throughout civilised space. It involves the use of magnets to both levitate and propel a vehicle along a preset route. The end result is typically something similar to the electrically powered trains of many industrial era civilisations, but hovering a small distance above its track. However, the potential speeds of maglev trains far exceed those of old electrical models. Ultimately, advancements in both engineering and energy technology made this technology ever more appealing as a form of fast, effective mass transit, with most maglev trains capable of reaching many hundreds of kilometers per hour. Most commonly, this impressive rapid transit technology is used on developed worlds as a form of cheap and fast public transport. On many of these worlds, in addition to standard overland travel, maglev systems will travel both through subterranean networks as well as traversing the many layers of multi-tiered cities and settlements. While Spaceports also offer similar (but more expensive) services, they are generally incapable of offering transit to subterranean regions. This can be especially important as maglev systems may act as the only significant supply line to these underground settlements.